Many of our forests and fields are under “assault” from a vast array of non-native species which threaten the habitats needed and used by our native plants and animals. As AOA adds conservation properties we are taking on more invasive problems and associated stewardship responsibilities. Many of the properties we are conserving have been negatively impacted by a variety of non-native, invasive species that have been allowed to proliferate and require much attention and resources. AOA takes our stewardship responsibilities seriously. We are continuing a strategic approach and development of the needed capacity to eradicate and/or control the “usual suspects” list of invasives that are degrading our fabulous properties and endangering the rich natural heritage we all value. We recognize that it will take time but are committed to this effort over the long term. We are confident that with the assistance of our friends and partners, we can make a difference and restore our conserved properties to benefit the native species that rely on these conserved habitats. Please support our stewardship efforts. AOA has invested in an AmeriCorps stewardship position and is working to upgrade our stewardship capacity. 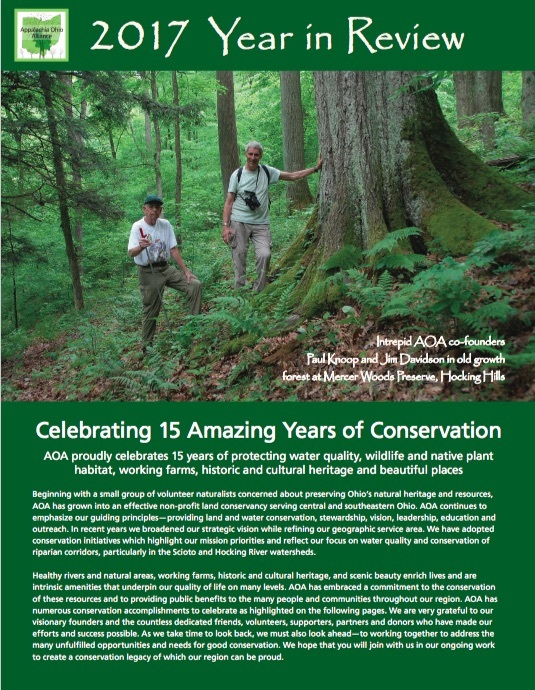 If you are unable to participate in our invasive removal efforts we completely understand and hope that you will still join us for other AOA events we have planned throughout the year. Please consider donating to our stewardship program, which will help us fund more AmeriCorps assistance and stewardship capacity in coming years as we continue to work on this issue and our habitat goals. To learn more about the importance of species diversity in the forest ecosystem and the reason that the control of Garlic Mustard is so important, please visit the Stewardship Network.